Vertica database audit solution by DataSunrise performs real-time tracking of all user activity and changes made to a Vertica database. Continuous activity monitoring helps to control inside and outside database traffic and minimizes risks by helping to reveal suspicious queries and potential vulnerabilities. Audit tool is an indispensable tool for cybercrime investigation, moreover, it helps to comply with SOX, HIPAA, PCI DSS and other standards. System events (authentication data, unsuccessful access attempts, configuration changes). Audit trails are indispensable while investigating data leaks or cyber crimes. What is more important, frequent monitoring enables you to prevent attacks before they do any sufficient harm. DataSunrise keeps track of outside requests and operations of company employees, helping to identify suspicious SQL queries. There is a sophisticated self-learning mode that analyzes corporate traffic and generates a list of SQL queries typical for this environment. The soft is easy to deploy, all the functions can be controlled via convenient-to-use graphical interface. In the section of audit rules, you can customize various parameters of database monitoring, which helps justify to different in-company needs. You can add your email address within rule settings and receive notifications of any suspicious activity. More detailed information on monitoring feature is available here. DataSunrise helps to comply with standards of PCI-DSS, SOX, HIPAA and other regulations. It supports Syslog protocol, so it is compatible with SIEM-systems. 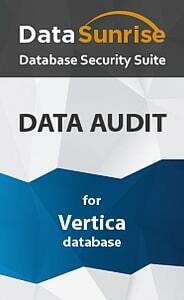 Vertica database audit solution by DataSunrise is a reliable tool designed to conduct 24/7 database activity monitoring and collect detailed information about all incoming queries and results of their execution. Another step in keeping your confidential information safe.